British Horror Films: Beyond Hammer & Amicus. Edited by The Dark Side editor Allan Bryce. 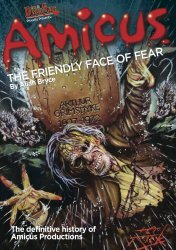 This is a fine companion to their other books, including Hammer: The Haunted House of Horror and Amicus: The Friendly Face of Fear. We have them all, while supplies last! 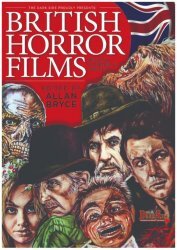 To tell the full story of British Horror Cinema, The Dark Side editor Allan Bryce has enlisted some of today's most highly respected genre authors, including award-winning writers such as Simon Fitzjohn, John Hamilton, Christopher Koetting, John Martin, Denis Meikle, Neil Pettigrew, and M.J. Simpson. Each one brings their unique style and knowledge to their specialist subject. Profusely illustrated throughout, with never-before-published stills, posters, lobby cards, and candid photographs, this lavish book is an essential purchase for any fan of British horror films! Copyright 2018 Ghoulish Publishing Ltd. First Edition Soft Cover. 184 pages including cover. Ordering and Shipping Note: This book is brand new and shipped to us directly from the publisher in the UK. It qualifies for economy Media Mail shipping in the U.S. However, if your order will also include items that do not qualify for Media Mail (anything other than books, DVDs and VHS. Magazines do not qualify because of the ads), you will need to do separate orders or choose a different shipping option. Choosing Media Mail when items do not qualify will likely delay your order and require additional postage. Don't have the Amicus book? Use the convenient Buy Both button below!